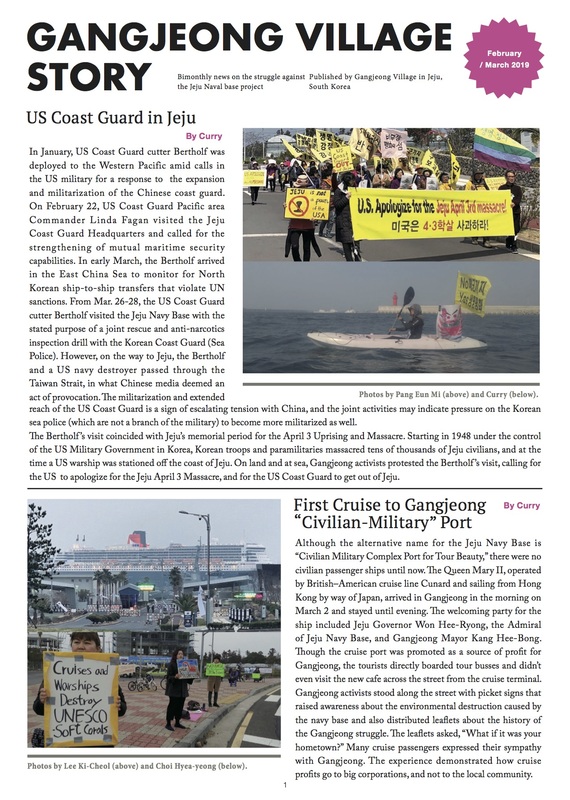 The Presidential election is now of the highest concern for the people against the Jeju naval base project. 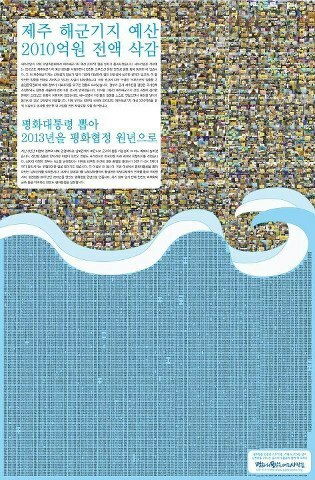 As the budget talk was postponed after the Presidential election and the budget matter would critically depend on the result of the Presidential election, people’s goal is now to win over the Saenuri party through people’s unity. 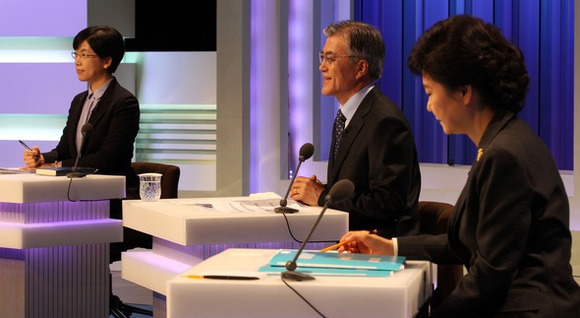 However, in the 1st Presidential candidates’ debate on the issues of foreign policy, politics, and security, that lasted from 8 to 9:40 pm on Dec. 4 (See the news article, here), the issue of the Jeju naval base project which is in fact, a center subject regarding the relationship with US and China was only very shortly mentioned. It could be partly because of the debate frame that does not allow talks in depth. 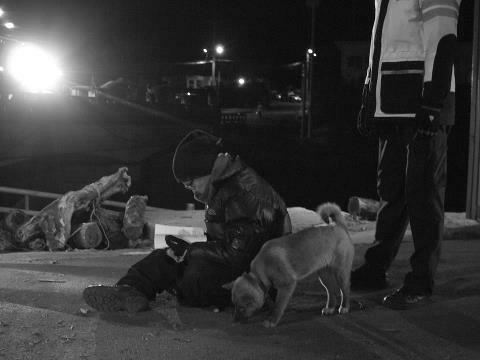 However, you can say, it is still media-controlled and sensitive issue in Korea. If there was any talk on the Jeju naval base project on Dec. 4 debate, it was raised as a tool by Park Geun-Hye who attempted to attack Moon Jae-In and Lee Jung-Hee, the Presidential Candidates of the Democratic Party and United Progressive Party with the issues of National Security law, ROK-US FTA and Jeju naval base issue, for the purpose of red-baiting and defame of the two opposition parties for their posed cooperation on the issues. It was Lee Jung-Hee who acutely refuted Park, reminding her of the Saenuri Party’s unilateral railroading of 2013 Jeju naval base budget on Nov. 28, to the infringement on the dignity of National Assembly, which was strongly protested by opposition groups. Moon Jae-In’s repute was more on general remark on the need of unity on the issues between two opposition parties against the ruling party. Whatever the politicians’ calculations on the naval base issue are, it is the people in the struggle field of Gangjeong, who are directly experiencing the daily violence by state power. Here are some scenes on the very debate night. 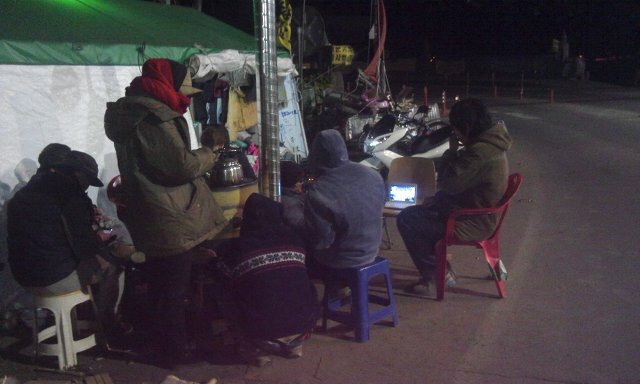 Around 8:40, Dec. 4, people who experience day and night struggle under the police oppression and company thugs’ physical muscle gathered in front of sit-in tent across construction gates to watch the Presidential candidates’ debate through TV. 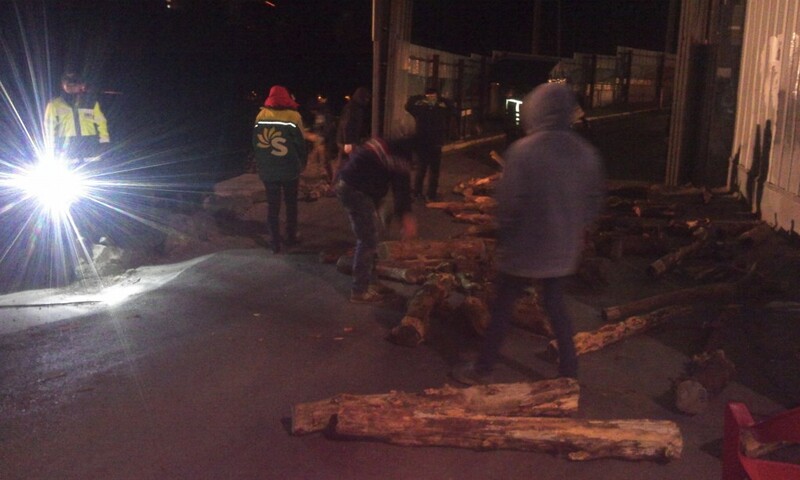 Around 9:10 pm, construction vehicles came and police circling of people began. “Why don’t you just watch the TV?” “We’ve come here during watching TV, too. You are the ones who should just watch the TV.” It was a conversation between the peacekeepers and policemen. When the police were to remove the lumbers filed up as people’s barricade, “We will do,” peacekeepers took them away and patterned out. 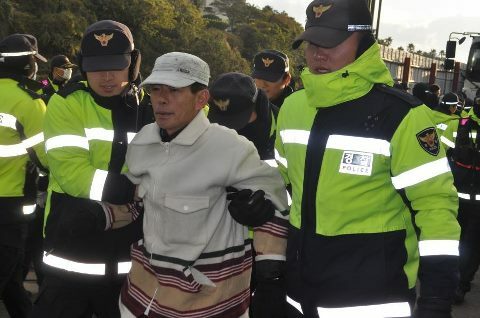 It seems to take similar time whether the police threw them out far away to the edge of the Gangjeong stream or the peacekeepers put them in pattern at the side of protest field, even though the peace keepers would suffer from such job again and again. “When did you start this way?” “Just minutes ago.” “It is a good idea.” It was a moment of the wisdom of the civil disobedience shining. 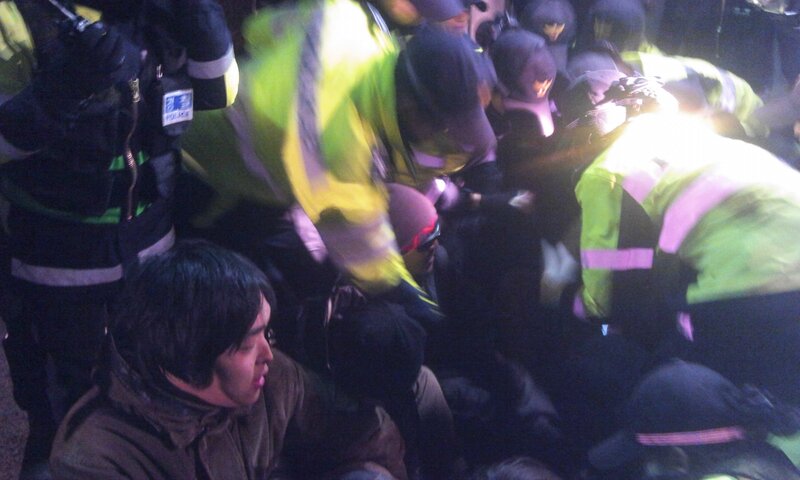 However the police muscle running right after the peace keepers made sit-in was same, “Ah.. I feel pain with my wrist. Do not pull away my arm!” “Don’t fold down my fingers!” The police circling of people ended with people’s scream again: Very routine, here. 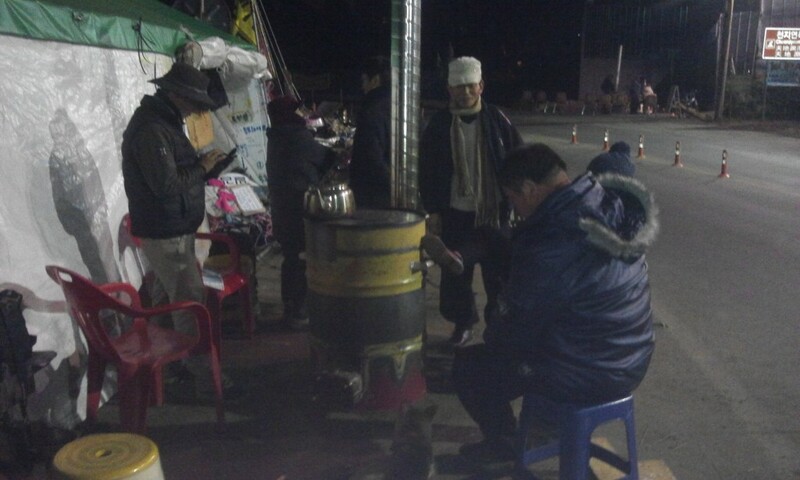 People watched the TV discussion again circling and sitting around a five stove, “Was there any mention on the Jeju naval base issue?” “Lee Jung-Hee questioned about it. But the debate moderator cut the chances on answers to it.” “Did he? Then when will they talk about the issue?” “ Well..we don’t kbnow. Maybe in the tourism section since it is the Civilian-Military Complex Port for Tour Beauty..” We all laughed hearing that.. “Maybe they may talk in art section, since it is related to Beauty (maybe in the high-tech art section..) The issue on the Jeju naval base project has been constantly media-controlled. That is why the politicians need to hush up on it? Or has the program itself been affected by Samsung? 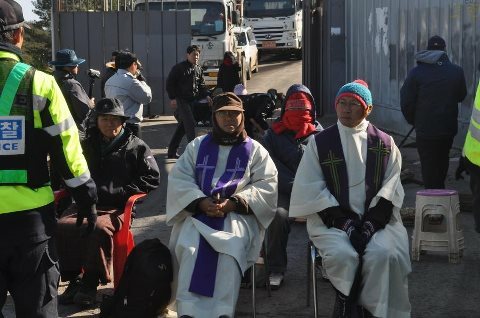 The Gangjeong Elating and Spicy Flower band(Flower band) started its concert campaign to cut the whole budget on the Jeju naval base project in front of the protest field of construction gate on Dec. 4. The music concert is held every 4 pm in front of the construction gate. It is open to everybody. Jo Yak Gol, member of the band writes. Video maker Dungree made a parody video on Park Geun-Hye. 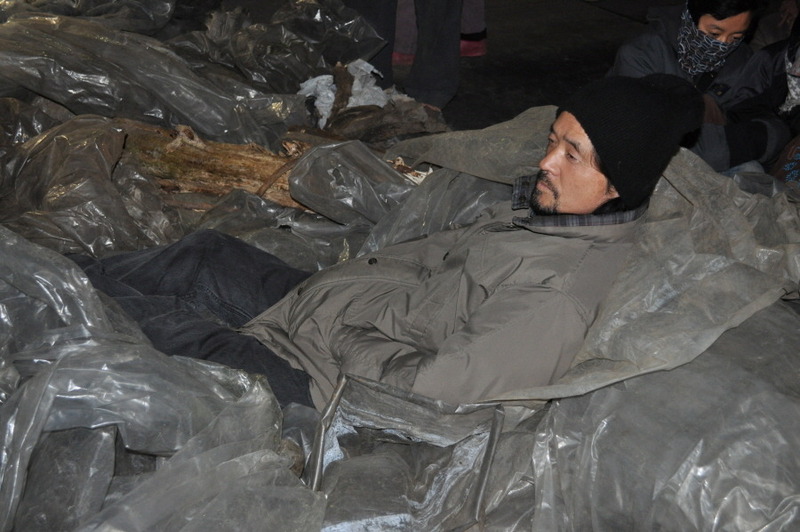 Photo by Park Jong-Hoon, a peacekeeper reads a book between the struggle times.